Hooray for my favorite blog post of the whole year!!! 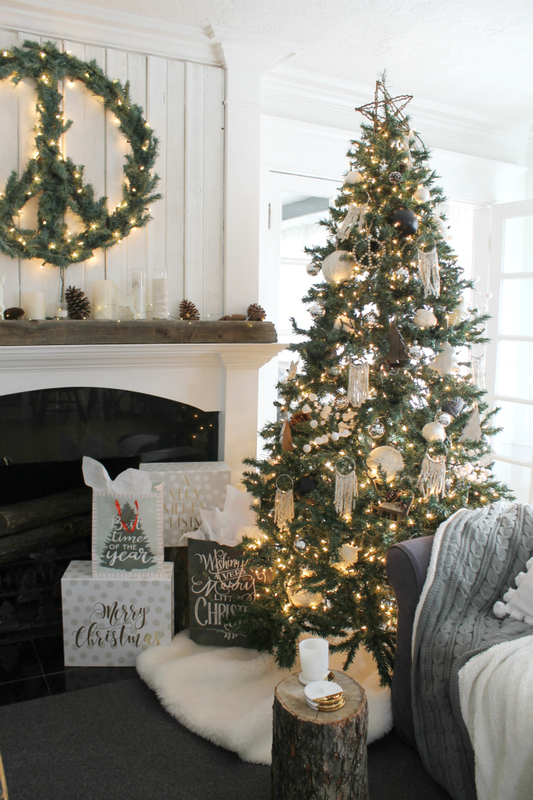 Seriously, I absolutely Love to decorate our home for Christmas and share all about it here on the blog. 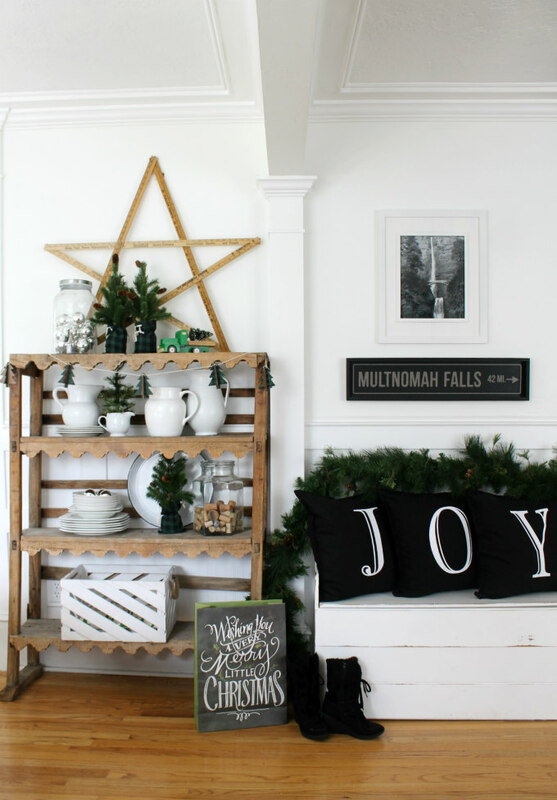 I also love stopping by all of my favorite blogger's home to see how they celebrate the season in their own homes. It's just SO much fun for me!! Today I joining 25 other bloggers in this Seasonal Simplicity Christmas Tour. Actually, this tour has been running all week long and today is the last day. 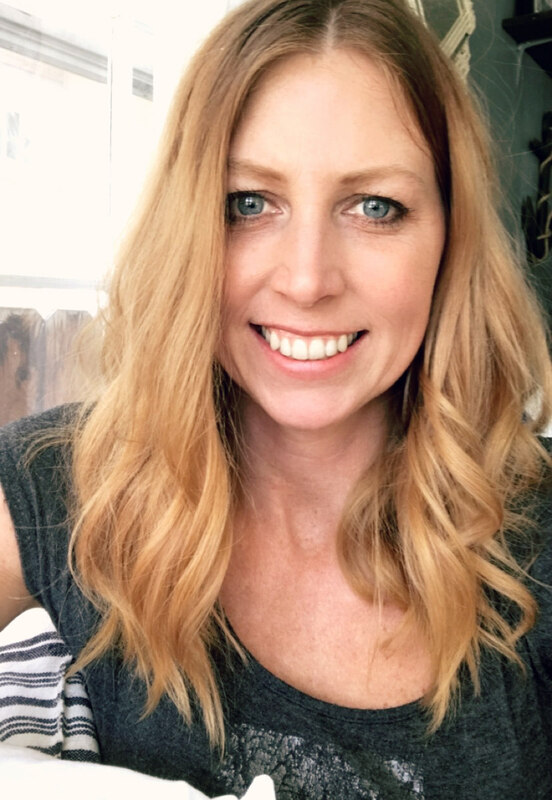 If you are not already following along, you can find all of the links and catch up at the end of this post. 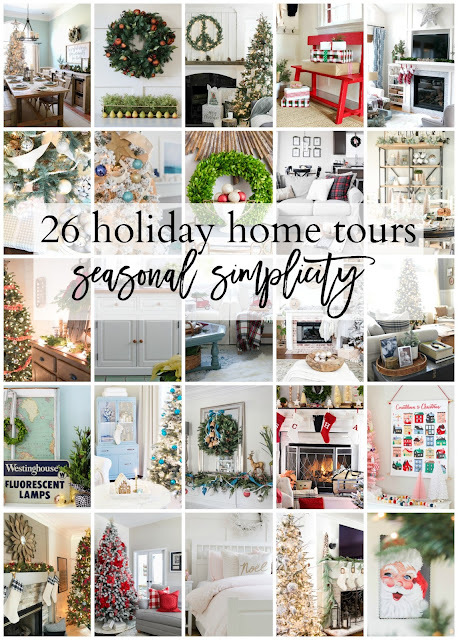 A big Thank You to Krista, from The Happy Housie, and April, from House by Hoff for hosting these Seasonal Simplicity Tours all year long. It's been a lot of fun! Welcome to my cozy cottage home! This wall here is the first thing you see when entering our home so I always try to make it look welcoming. The adorable JOY pillows are from my sister's Etsy shop. Learn more about them HERE. 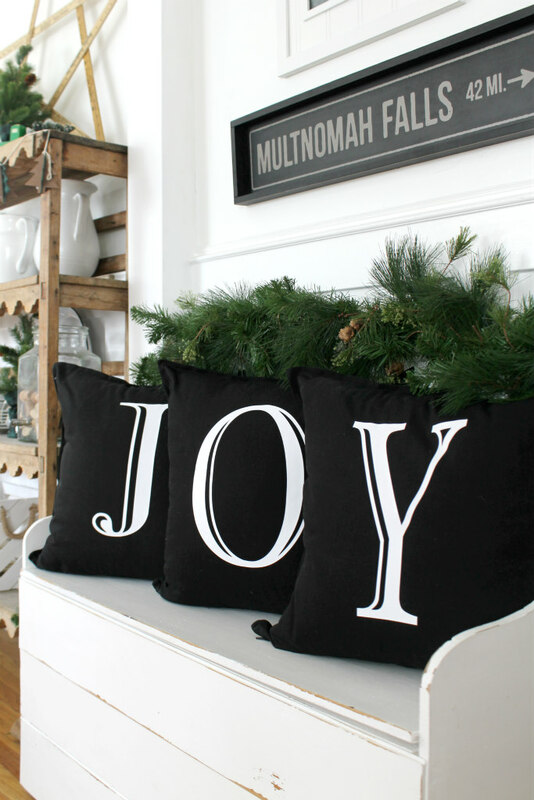 These JOY pillows are my most favorite new holiday decoration this year. Our living and dining rooms are right across from each other. 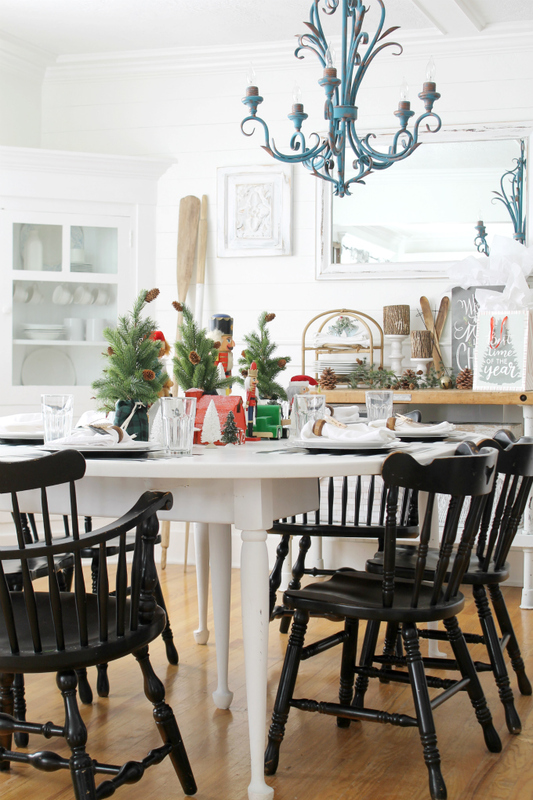 I already shared my dining room decorated for Christmas in this post HERE. I put together a Cheerful kid friendly tablescape for my whole family to enjoy. It included some of my boy's favorite decorations like the nutcrackers and a little village. My grandma's skis get put out every Christmas as a sweet reminder of her. This year I placed them in our dining room. Now moving on to the other side of the room, I'm excited to share my living room with you. My living room is my favorite room to decorate for Christmas. I recently got a replacement slipcover for my Ikea Ektorp sofa from Comfort Works and it really just changed the whole look of the room. Learn more about my new slipcover HERE. Above the couch I've framed some pictures that I took last month while my family was in Sun Valley, Idaho. I had Costco enlarge the pictures for me, and I am so happy with how they turned out. I'm kinda is Love with my Christmas tree this year. Although, I'm sure I say that every year :) Every Christmas tree is beautiful if you ask me. If you look closely, you'll see my Homemade Macrame Christmas Ornaments. I had so much fun making these this year. THIS post will teach you how I made them, plus it's linked to 11 other handmade ornaments from some of my blogger friends. 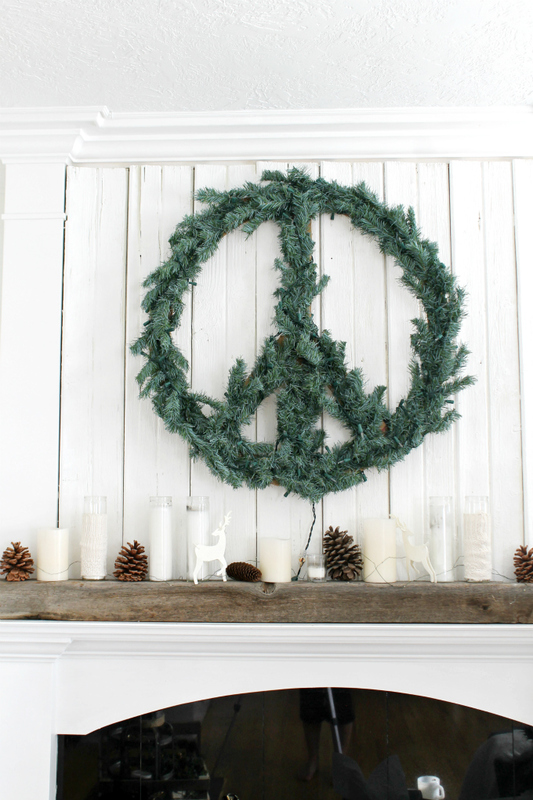 Another fun DIY project is THIS peace wreath that I made last year. Last year it hung in my bedroom, this year it looks so fun and festive hanging above my fireplace. The peace wreath has lights on it, so it shines really pretty at night time. I also have some fairy lights wrapped around a line of candles and pincones on my mantel. The lights on the tree, wreath, and mantle really look magical at night time. 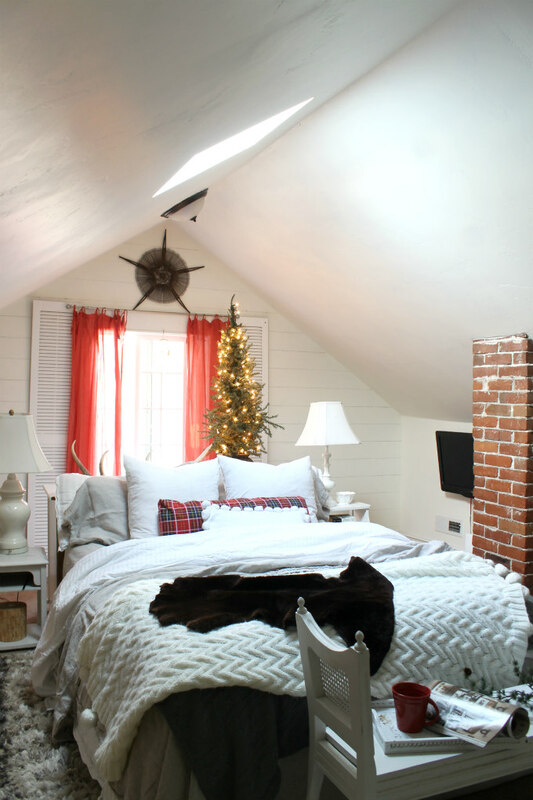 At lastly, I wanted to share a peek at my bedroom where I have added a mini Christmas tree. I'm telling ya, if you don't have lights or a Christmas tree in your bedroom, you need to :) I go to bed every night feeling Happy and Peaceful. 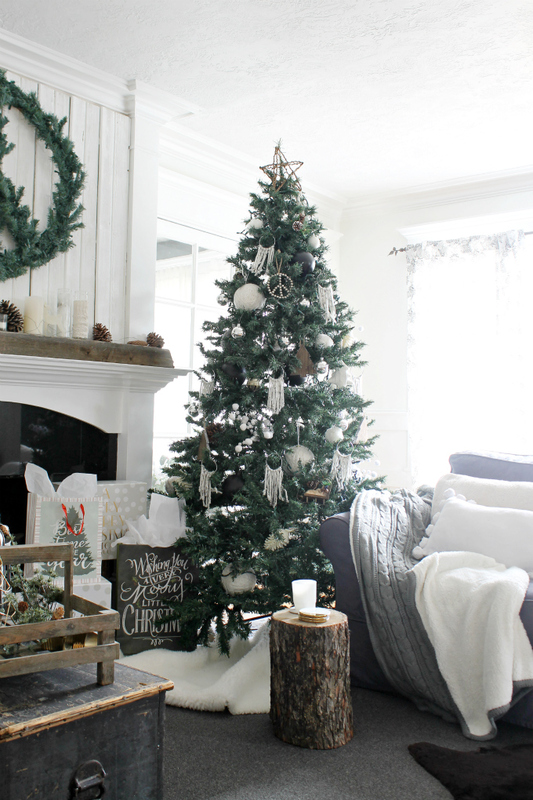 And there you have it, My Cozy Christmas Home Tour!! 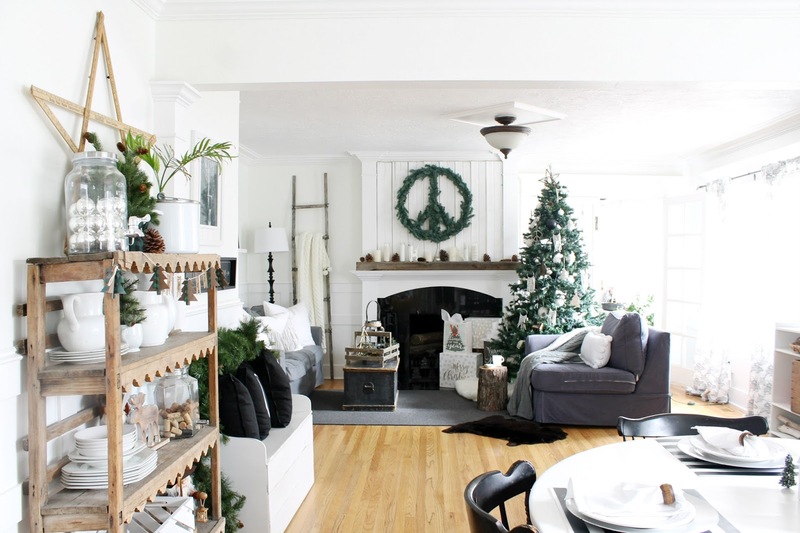 Now, let's go see how these other bloggers have decorated their homes. Always one of my favourite tours, Emily!! I absolutely love your style!! Your are a master! Thank you for joining in on this series with us!! Such a beautiful tour, Emily! I love your sparkly lights everywhere-- so festive! 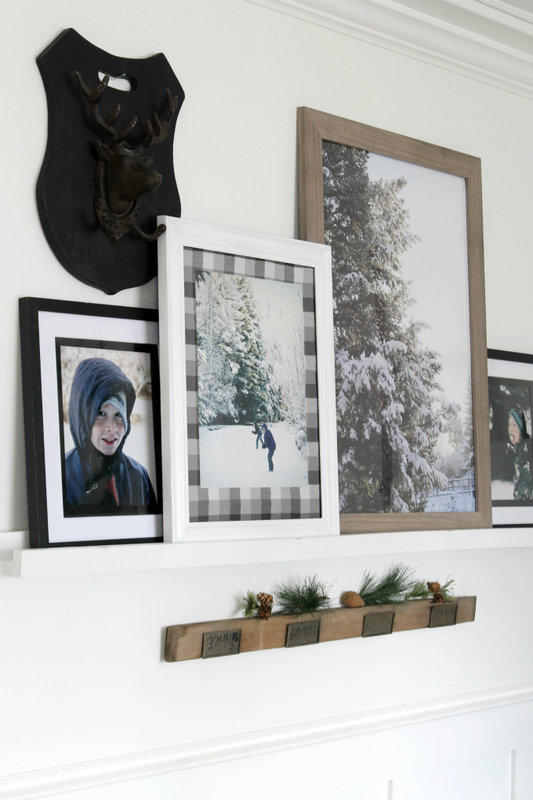 And the DIY additions are perfect! I hope you have a wonderful weekend! So lovely! 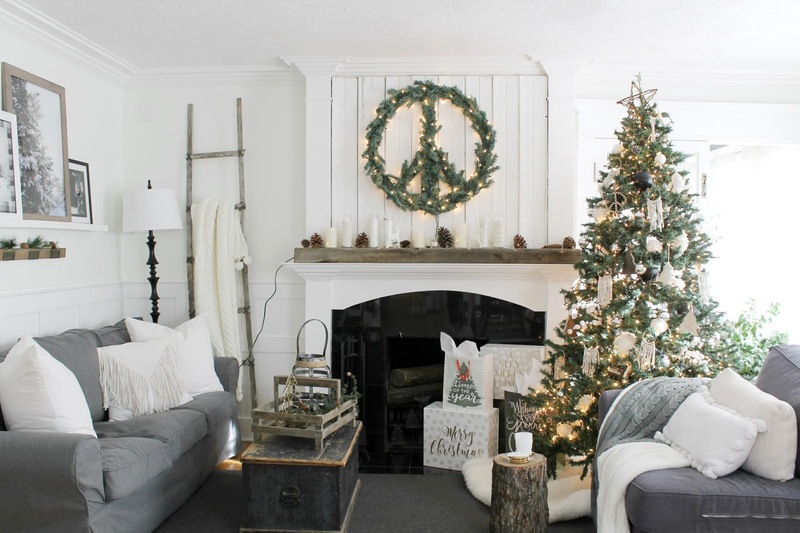 I just adore your style, it is crisp and clean with so homey and warm. 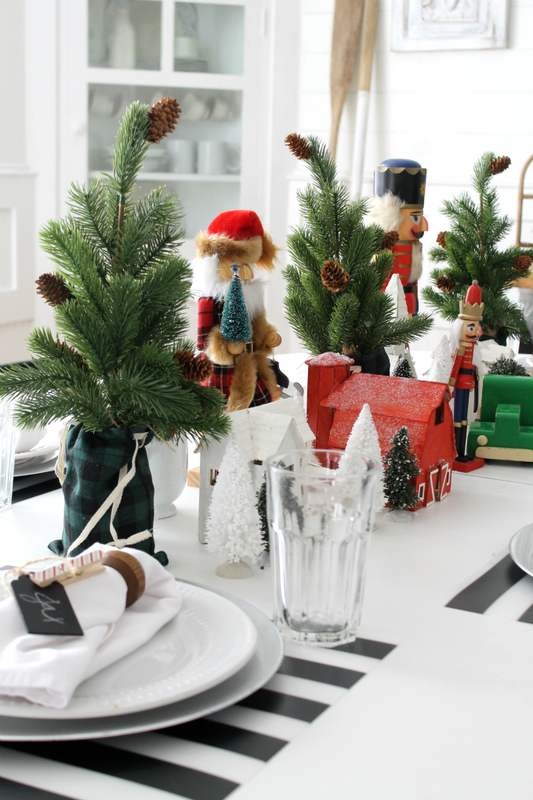 I like your table top decor, my girls would love the nutcrackers. Hope you have a Merry Christmas! Wow, your home is beautiful! 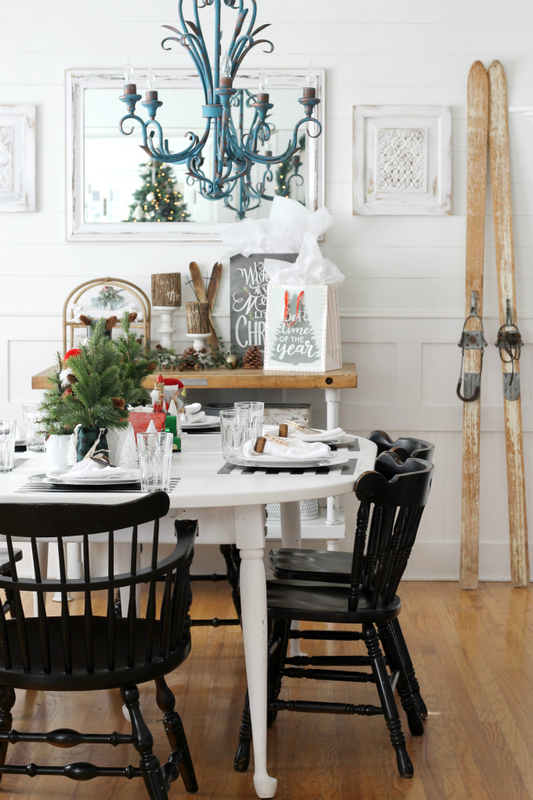 I love that you put your grandma's skis out every year, and that peace wreath is amazing! Your Christmas tour is so beautiful! 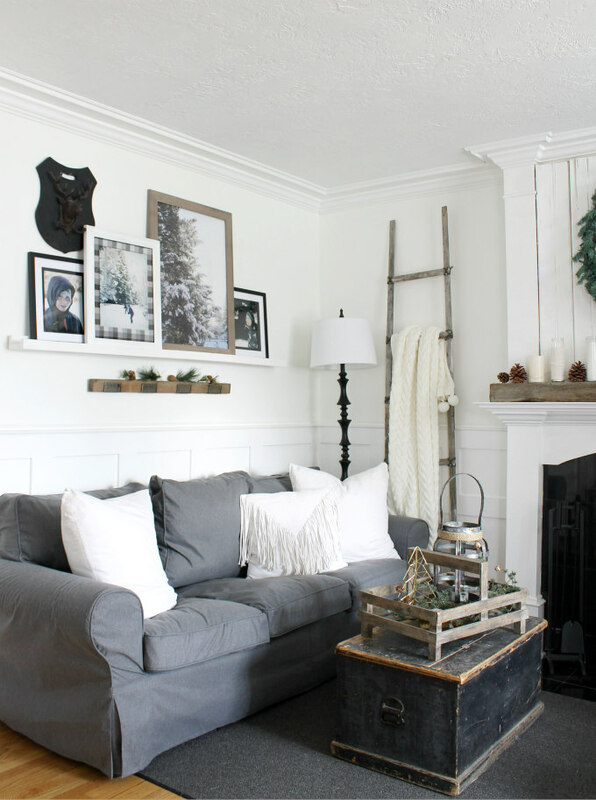 I love the peach wreath above the mantel. Happy holidays! Really enjoyed your Christmas tour. Your home is beautiful! 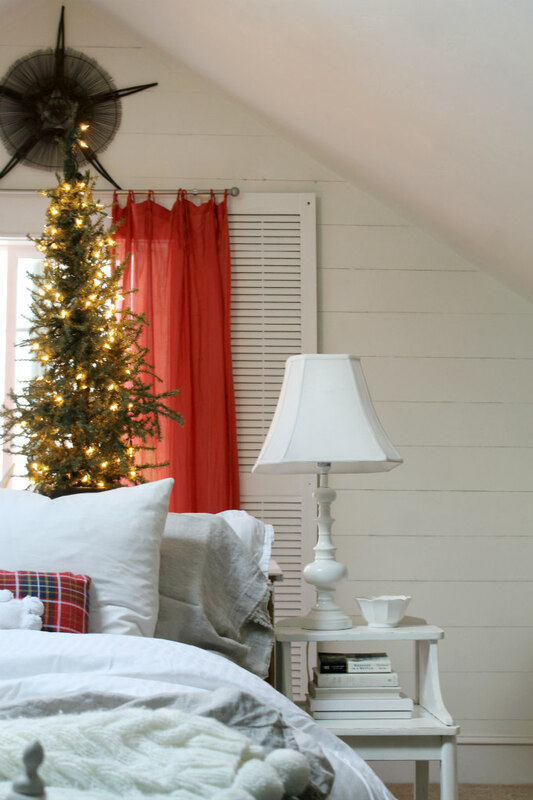 Love the idea of the Christmas tree in your bedroom. That is something I will have to do next year. Thanks for the great idea!